Mastic is a hamlet and census-designated place located in Suffolk County, on the South Shore of Long Island, New York. It is in the southeast part of the Town of Brookhaven. As of the 2010 census, there were 15,481 people, 4,726 households and 3,631 families residing in the CDP. The median income for a household was $70,979, and for a family $79,839. Males had a median income of $51,315 and $40,581 for females. The latitude of Mastic is 40.801N. The longitude is -72.841W. It is in the Eastern Standard time zone. Elevation is 30 feet. 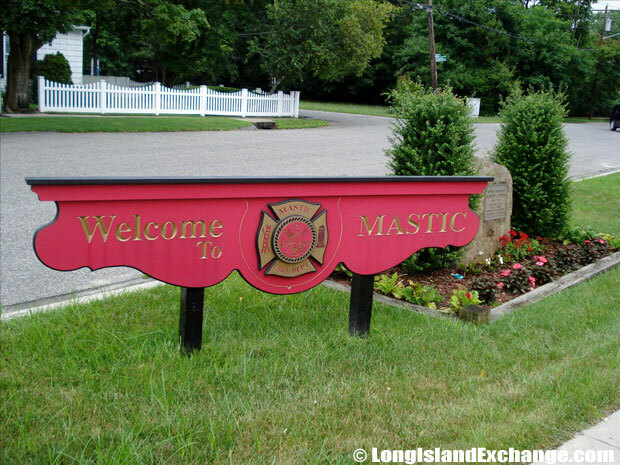 A sign highlighting the Mastic Fire Department welcomes visitors and residents to Mastic. 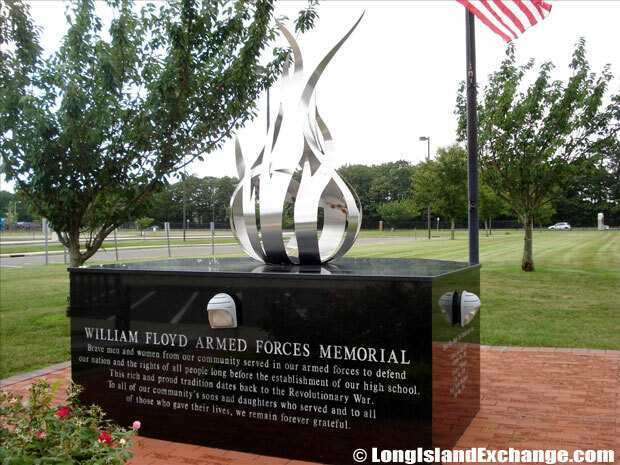 The William Floyd Armed Forces Memorial. 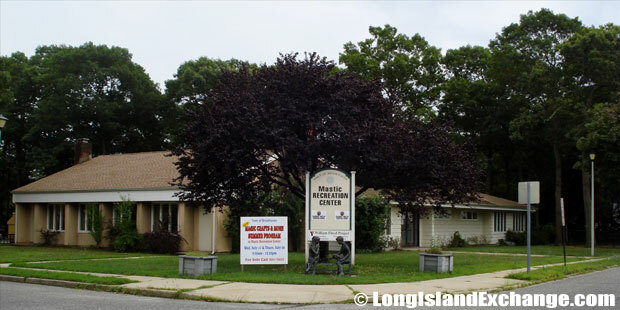 The Brookhaven Mastic Community Center. The Long Island Rail Road built a station here in 1882. “Mastic” is an Indian term used to describe a large body of water. The community name derives from Algonquian for “big stream.” It was originally called Forge and the name of the town was changed to Mastic in 1893. 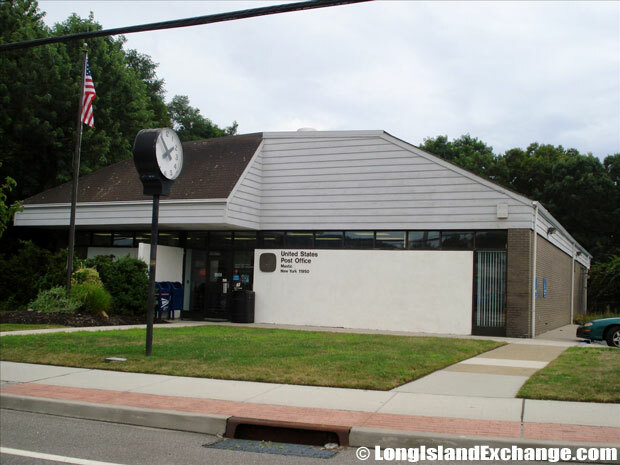 On July 15, 1960, the stop was moved 7010 feet west and renamed Mastic-Shirley. In recent time, the area is covered by Zip codes 11950 and 11951, and adds the term “Beach” for the sandy part of the locality that adjoins the Ocean. One might be misled by a satellite image to think that such prime land with its excellent location must be a prime resort or maybe a spirited commercial moon of the New York area. 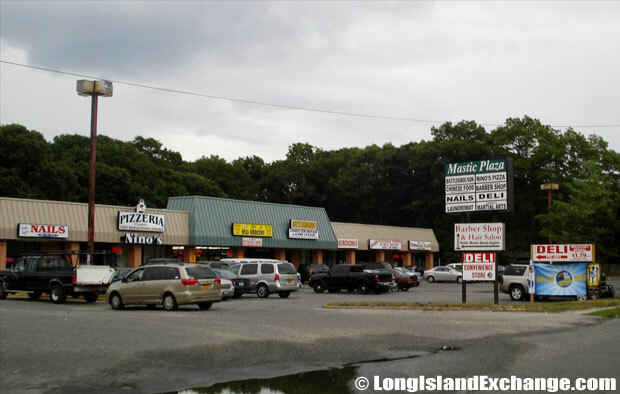 Mastic Shopping Plaza, Mastic Beach Road, Mastic Beach. 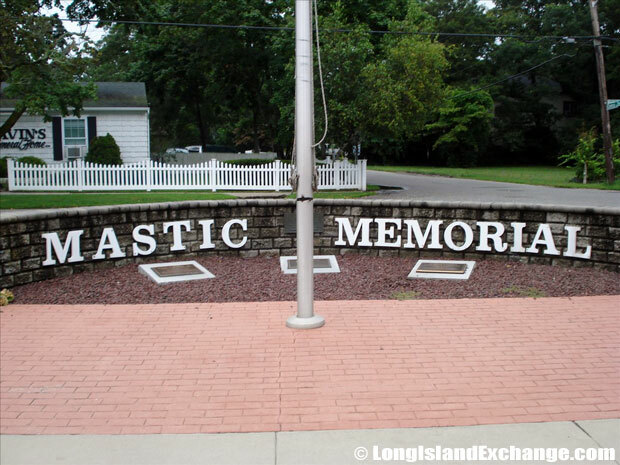 The Mastic Memorial Circle with three commemorative plaques centered around the flag pole. 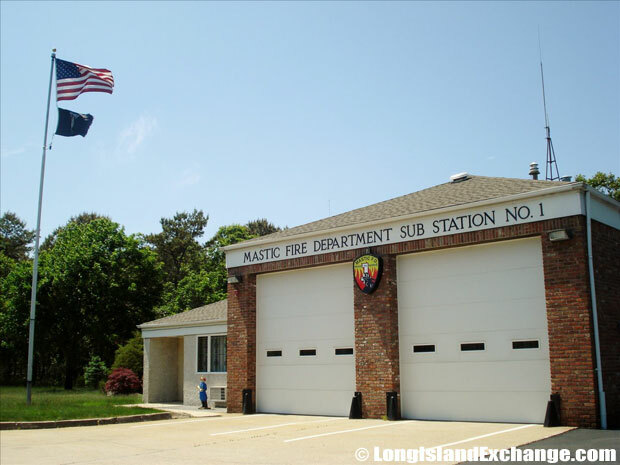 The Mastic Fire Department’s Sub Station Number 1. The racial-makeup of Mastic comprises of 59.26% White, 14.05% African American, 1.72% Native American, 1.12% Asian, 0.01% Pacific Islander, 3.59% from other races, and 2.25% from two or more races. Most of its resident’s ancestries were Italian, Irish, German, Puerto Rican, and English. 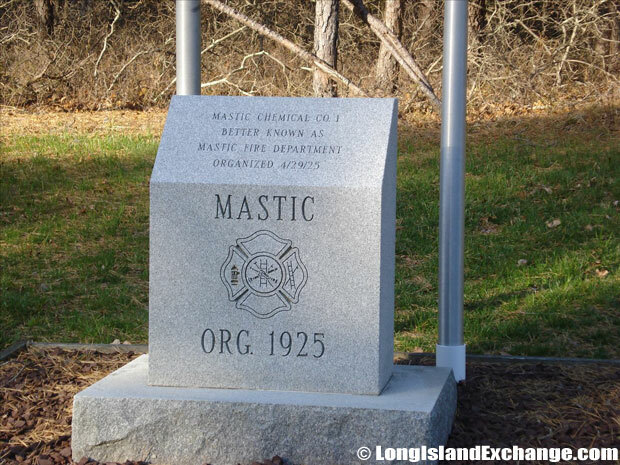 A memorial to Mastic Chemical Company #1, better known as Mastic Fire Department , first organized on April 29, 1925. 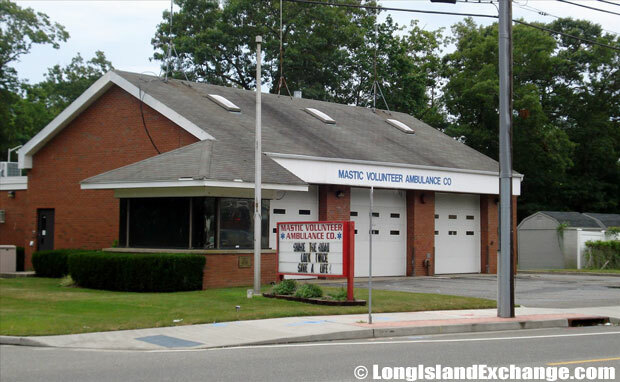 The Mastic Volunteer Ambulance Co.
Mastic is served by the William Floyd School District and the Eastport-South Manor Central School District. The Poospatuck Indian Reservation lies entirely within the area which is near in the southern end. It is located on the north side of Poospatuck Creek on the east side of Poospatuck Lane and south of Eleanor Avenue. This is a significant remnant of the Indian tribes that were the first people to live on Long Island. With 271 inhabitants, the Poosepatucks are doing their best to preserve their culture and way of life. In fact, there are festivals which held every summer and autumn to honor ancestors, celebrate traditional dance forms, and to enjoy food made from local produce and ingredients. There are also some rituals, the significance of which deserves deep study. 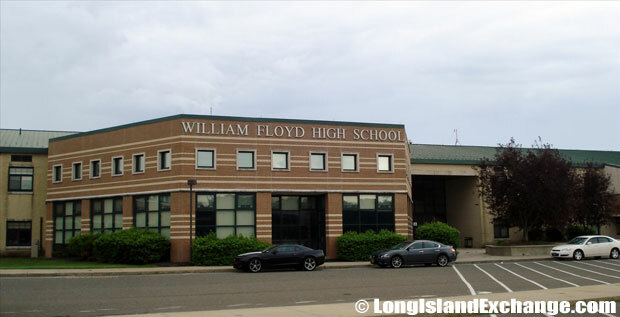 The Mastic William Floyd High School, part of the William Floyd School District which serves the communities of Shirley, Mastic, Mastic Beach, as well as Moriches. Mastic is not as well-developed compare to other neighboring hamlets. After all these years of spot fixing, the roads are a disaster which makes driving east to west a problem too. Some people were discouraged to live here but the local government is doing their best to develop and to become Mastic an urbanized place. The community is one of the last frontiers on Long Island for affordable housing.